This custom home features 6 bedrooms, 4.5 bathrooms and 6,053 square feet. The first thing you’ll notice is its transitional country architecture and robust landscape layout detailed with brick pavers in both front and back of the home. The exterior façade has a soft feel blending both modern and classic architecture with heavy cedar bracket details adding texture and depth. 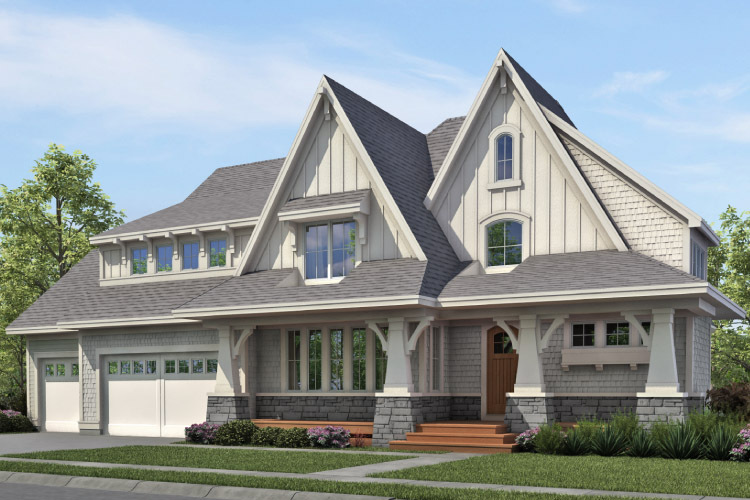 Some of the other focal points include an arched wood front door, wainscot stone veneer and 1×6 tongue and groove ceiling in the front porch. MAIN FLOOR – Step inside onto the warm white oak flooring and your attention will be immediately drawn to the second floor cat walk above. An arched opening to your left, leads you into the office which is beautifully lit with floor to ceiling windows. As you pass through the foyer and under the catwalk, you will glance up to an 18’ vaulted ceiling. The great room showcases a vaulted ceiling with floor to ceiling stone fireplace chase and built-in cabinetry. Walking into the kitchen, you’ll begin to recognize one of many arch and unique lighting details throughout the home. You will be blown away with the custom cabinetry, Cambria countertops, and attention to detail ranging from cabinet hardware to ceramic tile. This floor plan has the Master Suite on the main level. A unique feature is the master bathroom, with reclaimed wood-look porcelain tile floor and soft accents of Carrara marble in the shower, tub surround and vanity top. SECOND FLOOR – As you walk up the stairs, you’ll notice the balusters and newel posts are a focal point with a mixture of stain and enamel. The hallway opens up into a loft space with a custom built-in work stations that overlook the great room. Three bedrooms, two bathrooms, and a large bonus room are also on this level. LOWER LEVEL – Fully finished lower level has a more ecletic modern design with a full height brick fireplace and navy walk-up wet bar. You’ll see mirrored backs in the upper cabinets and more Carrara marble in the backsplash. It’s the perfect location for games and entertainment with a space for a pool table and game room. The lower level also has two more bedrooms, a full bathroom, and finished storage room. Overall this home’s features will leave you inspired. From the high quality finishes to the unique custom features, we feel you will be impressed. Stop by and walk-through this amazing home starting Saturday, February 28th! During Parade of Homes hours, the model will be open from Noon-6:00pm. On Mondays through Wednesdays, we will have it open to tour from Noon-5:00pm. This is a MUST-SEE home! For more photos, CLICK HERE.